Queen’s physicist James Fraser receives prestigious 3M National Teaching Fellowship. Provost Benoit-Antoine Bacon welcomes attendees to the celebration in honour of Dr. James Fraser's receipt of the 3M National Teaching Fellowship. Marc Dignam, head of the Department of Physics, Engineering Physics and Astronomy, discusses how Dr. Fraser's teaching has inspired students and colleagues alike. James Fraser thanks his past and present students and teaching assistants for inspiring him to continue improving as an educator. Students - past and present - as well as colleagues and supporters packed the foyer of Stirling Hall to celebrate Dr. James Fraser receiving the 3M National Teaching Fellowship. Throughout his career, Dr. Fraser has received praise and recognition for his unique, student-driven approach to teaching. As opposed to the traditional lecture format, in which students are presented with information to absorb, Dr. Fraser uses the assigned readings and the questions that they raise to guide the teaching process. By encouraging small group collaboration and discussion, the students are able to apply what they have learned and work through questions in a way that promotes a deeper understanding of the subject matter. Dr. Fraser was previously awarded the 2016 Medal for Excellence in Teaching Undergraduate Physics from the Canadian Association of Physicists, and the Queen’s Alumni Award for Excellence in Teaching in 2012. He is also a recipient of the Chancellor A. Charles Baillie Teaching Award. Dr. Fraser’s receipt of the 3M Fellowship is the latest major achievement for the Department of Physics, Engineering Physics and Astronomy – which has helped Queen’s cement its reputation as a world leader in research and education in the field. Queen’s is home to 2015 Nobel Prize recipient Art McDonald, as well as Gilles Gerbier, the Canada Excellence Research Chair in Particle Astrophysics. In 2016, the Canada First Research Excellence Fund provided Queen’s with a significant investment to support the creation of the Canadian Particle Astrophysics Research Centre (CPARC). "I can't think of a more deserving recipient of this award than James,” says Marc Dignam, head of the Department of Physics, Engineering Physics and Astronomy. “Since his arrival in the Department, he has been a driving force behind the continual innovation and renewal of our courses. His impact on the first year physics course, in particular, cannot be overstated. 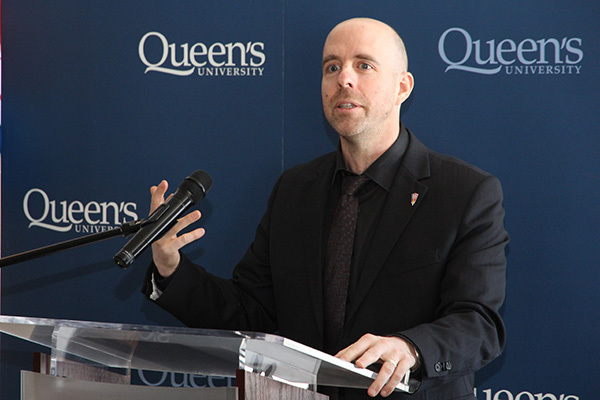 I firmly believe that his innovative, student-focused approach has not only improved the learning outcomes and student satisfaction in this key course, but has also resulted in significant growth in physics majors at Queen's." Queen’s recognizes the importance of promoting active learning and student engagement to enhancing the student learning experience. Experiential learning activities help students apply what they have learned inside the classroom and allow them to deepen their knowledge and skills. This commitment to experiential learning is exemplified through a wide range of practical, hands-on learning opportunities embedded in academic programs – such as such as internships, practica and service learning. The 3M National Teaching Fellowship is amongst the most prestigious recognitions of excellence in educational leadership and teaching in the post-secondary sector. Founded in 1986 through a partnership between the Society for Teaching and Learning in Higher Education and 3M Canada, up to ten Canadian academics annually are named fellows. Fellows become life members of the society – taking part in its annual meeting and working to create new ways to foster academic excellence. For more information on the 3M National Teaching Fellowship, please visit the website.